Option B) 3 sets of 25 reps – If you don’t have access to a gym or heavy weights try the lighter-higher rep version. 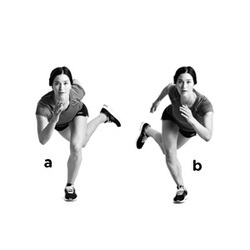 Tabata sets for muscle endurance and aerobic capacity. Complete 8 sets of each exercise for :20 seconds maximum effort and :10 second rest. Do each exercise 8 times before moving on to the next exercise in the list.